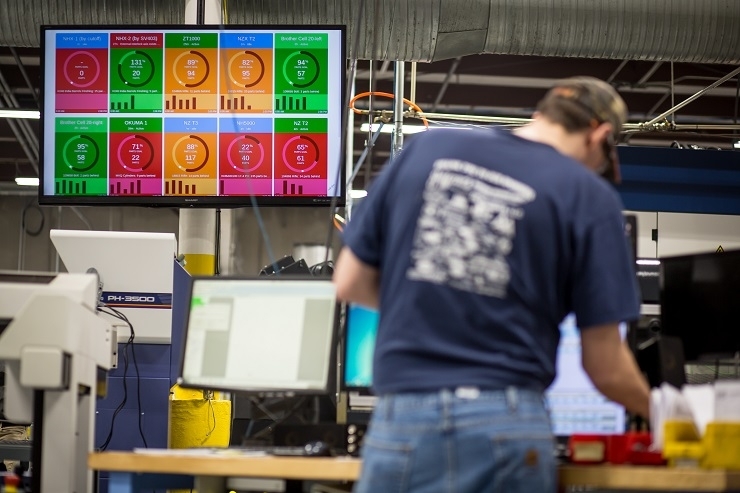 MachineMetrics creates software to simplify Industrial IoT for the factory floor, offering advanced machine monitoring to help manufacturers make faster, more informed decisions about process optimization and maintenance needs from real-time machine data. With Instant notifications, real-time dashboards and detailed analytics, the MachineMetrics suite puts actionable data in the hands of operators quickly, easily and affordably. The MachineMetrics team had created a cutting edge solution to help manufacturers analyze and optimize their facilities. But now they needed an IoT Gateway platform that could be installed at client sites and offer the same flexibility and reliability that they had carefully built into their software suite. "We started off developing on standard tower PCs and had a range of challenges with them," says MachineMetrics COO and Co-Founder Eric Fogg. "A standard computer can't stay cool in many of the environments we're installing them in, and they're often way too big. They just aren't designed for industrial use. We also experimented with single board solutions like the BeagleBone but it couldn't deal with shop floor electromagnetic interference, and the performance was buggy. We wanted a solution that was truly intended to be installed in manufacturing environments." In addition to reliability, Eric and his team needed a device that would be able to easily connect to the wide variety of production, machine vision and automation devices their software was designed to interface with. "Every machine that we connect is different. Each time our technicians go into a shop they may have 25 machines that might use 25 different protocols, or they have physically different connectors that they need to interface with. Over the years we've accumulated a lot of knowledge and experience in making those connections to ensure effective communication between devices, but our hardware solution had to be as flexible as our software in terms of connectivity." Finally, they were interested in developing a device that would help them expand their visibility in the growing factory analytics and automation industry. "It had to work well but also be eye catching and offer us a visual differentiator in the marketplace." The ML100 Industrial NUC checked all of the boxes for MachineMetrics. The system's small, footprint gave them the installation flexibility they needed while still providing the necessary connectivity and ample processing power to collect and relay the requisite machine data. "The ML100 was the right combination of size, performance, features and connectivity. Essentially it had everything we needed and nothing we didn't. The small size was appealing and the Windows OS was a must-have to ensure we could easily add our software stack. The system serves as our relay server, taking all the raw machine data, encrypting it, packing it up and sending it to the cloud service for analyzation." Once they had settled on a platform, Eric and his team wanted to take the extra step of creating a truly unique device. 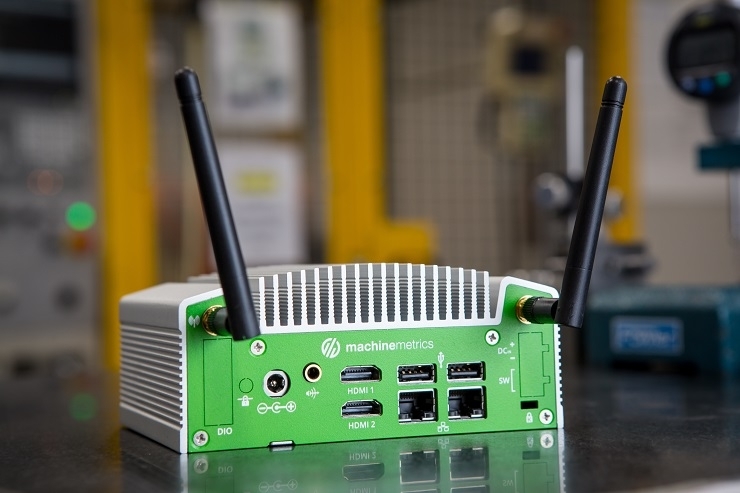 Using Logic Supply's Rapid Branding Service, MachineMetrics was able to brand their ML100 Gateway with their company logo and colors. "We put a lot of care into building our software and we wanted the physical representation of our product to echo that care and consideration. The branded ML100 allows us to do that. We currently have fifty or sixty Logic Supply systems in the field and we haven't had a single hardware failure, even from systems that have been installed for more than two years in very dirty environments. Just picture a gateway system sitting on top of a machine, covered in grease or plastic or metal shavings, that's the environment these systems are subjected to. We have to put the hardware where the client needs it so having devices we can count on has been paramount." To learn more about MachineMetrics and their custom ML100 solution, read our full interview with MachineMetrics Co-Founder Eric Fogg over on The I/O Hub.